Blue Forest’s A Leafy Home Tree House is an adventure hideaway and a comfortable garden retreat. This miniature home is a perfectly different space with a homely warmth and enough space for entertaining friends and family, or relaxing on your own in comfort and style. 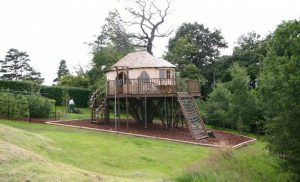 Situated in a garden in the Nottinghamshire area, the tree house is surrounded by a grassy lawn and enclosed by hedges and trees making A Leafy Home Tree House an excellent, safe and enclosed play area for children. 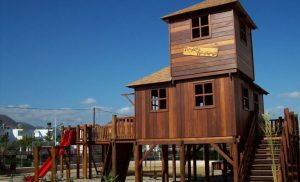 Whether they are rushing up scramble net, sliding down the fireman’s pole, or racing around the base of the building, the play bark ground surfacing assures a soft landing. The tree house’s natural cedar shingle roof is complemented in its design by rustic timber walls and play bark surfacing at the base of the exterior of the structure. 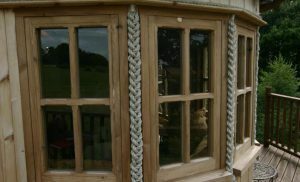 The play bark is used for its practical safety and has the added benefit of echoing and enhancing the earthy aesthetic of the build. 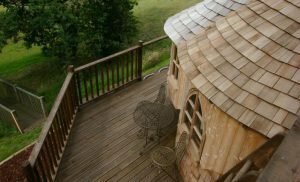 The natural elements incorporated into this innovative design allows the tree house to sit comfortably in the surrounding garden. 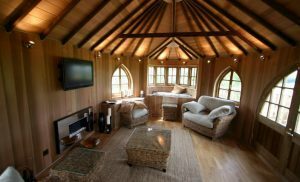 Access to the tree house is via a short staircase to the main deck and house, with generously spaced elegant arched windows, allowing plenty of light to enter. The arched double doors open inwards to allow fresh air in and grant easy passage to the balcony walkway. 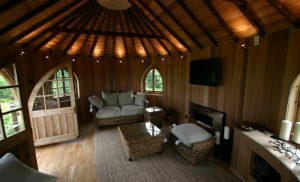 The interior of A Leafy Home Tree House is fully lined with cedar and features a range of home comforts — from the necessary to the nice-to-have. Decorated with big, homely cushions scattered on a sofa and arm chair, this snug yet roomy space feels like your own living room. 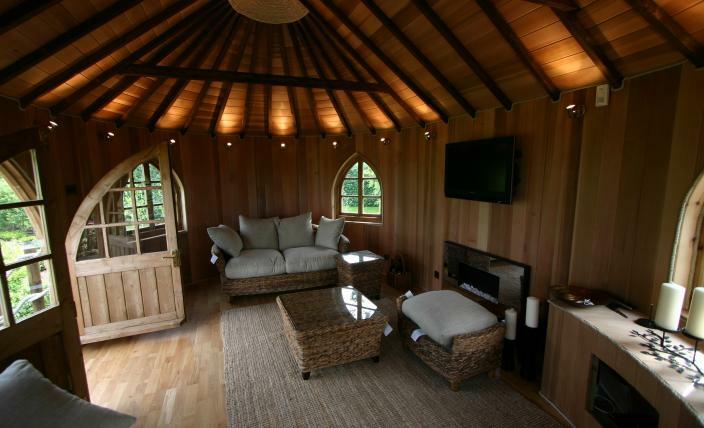 When you need your retreat to unwind, you can nestle into the intimate reading nook with a good book, or gaze out at your luscious garden and watch the sun go down. Thanks to plenty of soft interior lighting you won’t have to go back indoors once the sun sets either. This hideaway is ideal for bunkering down on lazy evenings to watch movies on the flat screen TV or play board games with the family. And with the warm glow from the fireplace, you may be tempted to stay there all evening, even in the winter. 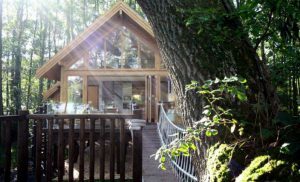 The appeal of this luxury tree house is not only its bespoke Blue Forest design but its ability to cater for both the playful and the necessary–with ease and style, marrying the excitement of a tree house climb and the restfulness of a cosy retreat. Blue Forest were delighted to have completed this fantastic lakeside tree house at Cleveley Mere. This spectacular, contemporary design includes a rope bridge, sun deck and floor to ceiling windows that provide wonderful views of Cleveley Mere lake. 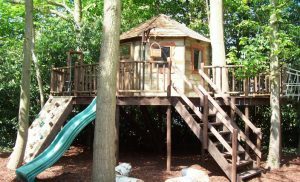 Ramshackle tree house is full of character and provides a beautiful and exciting place for the client's children to play. 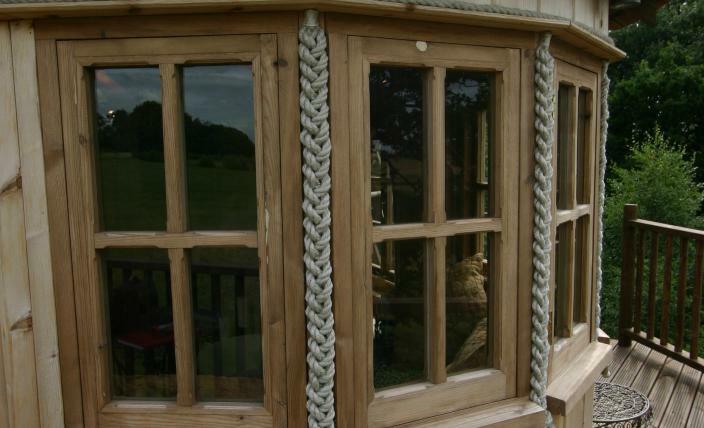 The structure's features include a climbing wall, slide, basket and pulley and a rope bridge to a second deck, providing hours of endless fun.